The phase 3 GIMEMA-MMY-3006 study comparing bortezomib-thalidomide-dexamethasone (VTD) versus thalidomide-dexamethasone (TD) as induction therapy before, and consolidation after, double autologous stem-cell transplantation (ASCT) for newly diagnosed multiple myeloma (MM) provided demonstration of prolonged PFS, but not OS, for patients randomized to the VTD arm (Cavo M et al, Lancet 2010; Blood 2012). Based on superior rates of high quality response and PFS, a bortezomib-based triplet is currently considered as the standard induction therapy for ASCT-eligible MM patients. However, no data from prospective phase 3 trials have so far shown an OS benefit from incorporation of bortezomib and an immunomodulatory into ASCT. The current analysis was aimed at evaluating long term results of the GIMEMA-MMY-3006 study. Overall, 474 patients were included in the trial, and of these 236 were randomized to VTD and 238 to the TD arm. Median follow-up for surviving patients was 92.8 months (IQR: 59.6-123.0). Analyses were performed on an intention-to-treat basis. Median PFS was 56.5 months for patients randomly assigned to the VTD arm, and 41.3 months for those in the TD group (HR=0.66, p<0.001). PFS benefit with VTD was seen for patients with ISS stage II-III (HR=0.68, p=0.007) and ISS stage I (HR=0.60, p=0.005), as well as for those with t(4;14) and/or del(17p) positivity (HR=0.45, p<0.001) and negativity (HR=0.66, p=0.003). Median OS was not yet reached in the VTD arm and was 118.6 months in the TD arm (HR=0.71, p=0.024), representing a 29% reduction in the risk of death with incorporation of VTD into double ASCT (Figure 1). Estimated rates of OS at 93 months were 67.6% and 58.5%, respectively. Superior OS benefit with VTD over TD was retained across prespecified subgroups of patients with both high-risk and low-risk disease, including those with ISS stages III (HR=0.52, p=0.056), ISS stage I (HR=0.56, p=0.033) and cytogenetics by FISH. In particular, VTD significantly prolonged the OS of patients with both t(4;14) and/or del(17p) positivity (HR=0.57, p=0.031) and negativity (HR=0.66, p=0.034). On multivariate Cox regression analysis, randomization to VTD was an independent factor predicting for prolonged PFS (HR=0.62, p<0.001) and OS (HR=0.61, p=0.001). Additional disease-related variables with a favorable impact on PFS and OS were absence of t(4;14) and/or del(17p) (HR=0.50, p<0.001; HR=0.49, p<0.001), and β2-microglobulin <3.5 mg/L (HR=0.60, p<0.001; HR=0.51, p<0.001). Further analyses of PFS2, time to second anti-MM therapy, and second primary malignancies will be presented at the meeting. 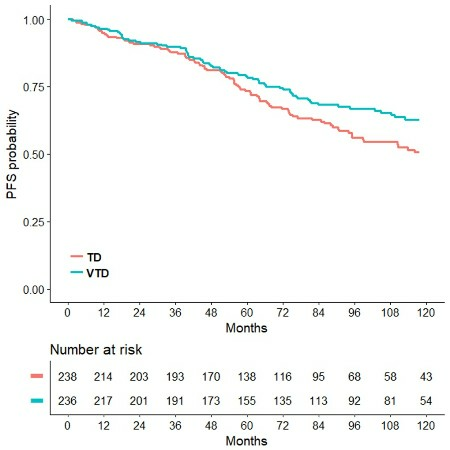 With an extended median follow-up of 7.6 years, a persistent PFS benefit with incorporation of VTD into ASCT was confirmed. Moreover, a longer OS from primary randomization to VTD versus TD was demonstrated in the overall population, as well as in subgroups of patients with high risk and low risk MM.